Families looking for Florida colleges should start at The Florida Student Scholarship and Grant Programs which is sponsored by the Florida Department of Student Financial Assistance. This is essentially the state site for state funded grants and scholarships. The website includes information on the Bright Futures Scholarship Program and the Talented Twenty Program. The site contains the online and PDF version of the Florida Financial Aid Application. The Florida Choices website is sponsored by the Florida Department of Education. Students who register can create a portfolio of work and take various skills assessments. Users can search for colleges using the school finder which searches on an extensive list of characteristics and isn’t limited to Florida schools. The site includes a scholarships search and the ability to compare schools. There is also a good overview of the federal financial aid programs. The department also sponsors the College Goal Sunday website. The Florida Association of Student Financial Aid Administrators provide a ten page PDF on Planning for a Higher Education under the Be College Go To School Brochure. Although not very user-friendly, students planning on starting out at a community college might want to visit the Department of Education’s Articulation section. According to IPEDS, there are 69 Florida colleges with 500 or more full-time undergraduates. These include 22 institutions that grant some four-year bachelor degrees but are primarily community colleges. Of the 441,778 students, almost 78.9% attend the 36 public institutions in the state compared to the 21.1% at Florida’s 33 private colleges. 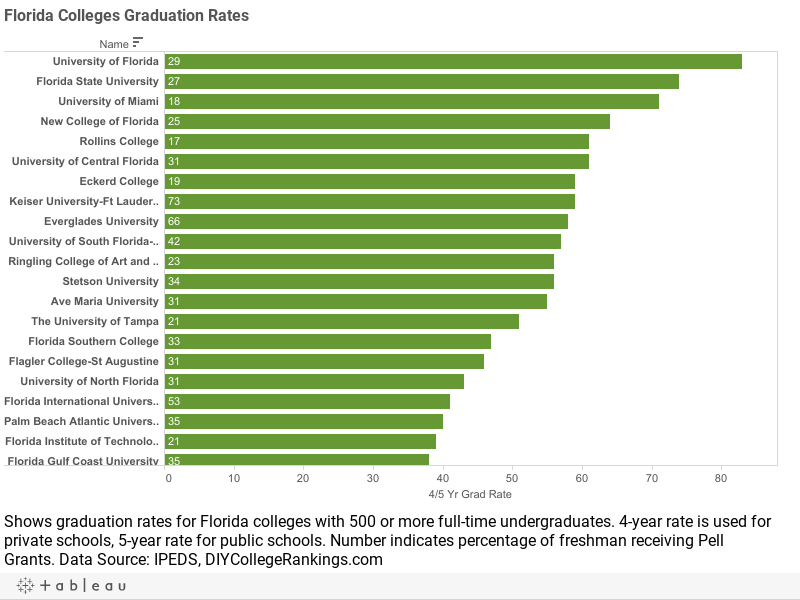 The average four-year graduation rate for private Florida colleges is 34.1% and the five-year rate for public-institutions with available information is 49.7%. 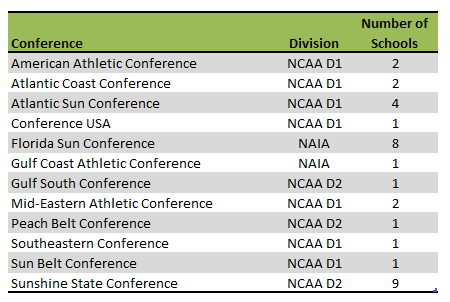 A total of 11 schools meet the DIY College Rankings 50-50 profile requirements. College-bound seniors in Florida had an average of 19.6 ACT Composite score with a 18.7 for English and 19.5 for Math. The 75th Percentile scores were a Composite of 23, 23 for English, and 23 for Math. A total of 29 colleges ACT 75th% Composite scores were at or above this level.